The 2382-15 17th Edition Manchester includes all essential elements of the previous 17th Edition course and also now includes the new amendment 3 sections. The 2382-15 remains a classroom based course with no practical work and focuses on the essential aspects of 17th Edition Regulations. Part 2 Definitions – This section could be expanded and modified with some of the terminology changing to avoid confusion and promote further clarity. Chapter 52 – Selection and Erection of the Wiring Cables: Cables concealed in a wall or partition -This section could be rewritten and all references to the phrase ‘under the supervision of skilled and instructed persons’ may be removed. Section 557 Auxiliary Circuits – This section is a proposed new addition to the regulations and will cover things like auxiliary circuits for low voltage electrical installations. These types of circuits are for the transmission of signals intended for the detection, supervision or control of the functional status of a main circuit. Section 717 Mobile and Transportable Units – This covers units which are self propelled, towed or transportable containers or cabins. Risk reduction requirements include automatic disconnection by RCD, accessible conductive parts to be connected through equipotential bonding to the main earth terminal within the unit, and the type of supply, voltage rating, number of phases, on board earthing and maximum power required. Section 559, 714 and 715: Luminaires and Lighting Installations – Changes are proposed to bring this section together with the latest IEC and CENELEC standards. Section 715 Extra-low Voltage Lighting – This refers to installations supplied from sources with maximum rated voltage of 50Vac rms or 120Vdc. Changes are expected to go along with the latest IEC and CENELEC standards. Section 714 Outdoor Lighting Installations – Only minor changes are proposed in this section including things like requiring individual circuits to be isolated. Chapter 41 Protection against Electric Shock – It is proposed that any reference to ‘ordinary persons’ is removed and protection for socket outlets up to 20A for all installations is required. However, those with RCD protection for specific labelled socket outlets or where a risk assessment has decided that RCD protection is not necessary are exempt. ‘Cmin’ Factor – It is proposed that the maximum earth fault loop impedance is revised to account for the Cmin factor. Notes on the tables will be changed to reflect maximum permitted operating temperature. Chapter 42 Protection against Thermal Effects – Regulation 421.1200 requires switchgear assemblies including consumer units to have their enclosure manufactured from non combustible material to help protect against fire. Condition Report – A few changes are proposed to the electrical installation condition report and notes. It proposes changes to the certification of new work – the schedule of inspections for new work to be replaced by examples of items that require inspection during initial verification. There is a two hour long examination that tests your understanding of the subject matter which is taken on the third day of the 17th Edition Manchester course. All learners who successfully pass the 2382-15 17th Edition course and examination will receive a qualification certificate proving that they are qualified to carry out work to 17th Edition standards. The entire 17th Edition course including amendment 3 is three days long in total. This course is most suited to anyone wanting to work in the electrical industry, or those who are already working in the industry but now need to update their skills to cover the new 17th Edition amendment 3 regulations. The 17th Edition qualification is one of the basic standard qualifications required, to work in the electrical industry. Anyone holding a 2382-15 17th Edition will be able to continue on to further, higher level qualifications in order to develop their skills, knowledge and employability. To gain entry to the 2382-15, learners must have an interest in the subject and a desire to learn. There are no formal entry requirements, however the nature and intensity of this course means that any prior electrical knowledge and training would be highly beneficial and advantageous for the understanding and chance of success on this course. All learners must familiarise themselves with, and bring to the course, a current copy of the 17th Edition Wiring Regulations. From January 2015, the 2382-15 17th Edition course Manchester becomes the only 17th Edition qualification available as the older 17th Edition course is being retired. 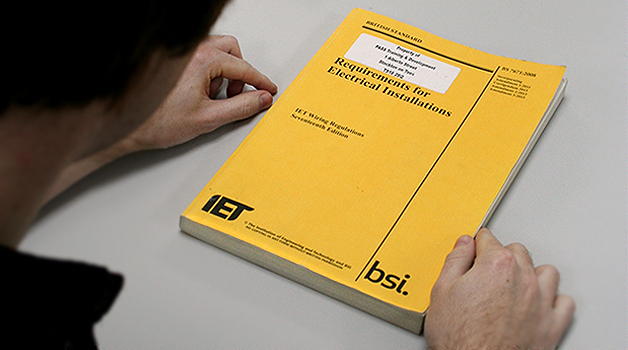 Even experienced electricians will need to update their qualification to the new 17th Edition by July 2015 in order to stay current. If you are new to the industry, the 2382-15 Manchester is the course you will need, to gain a 17th Edition qualification.